We offer family law help with Divorce, Child Custody, Child and Spousal Support, Debt and Property Division and Division of a Family Business. Jefferson L. Stacer has been practicing law in San Diego since 1979. He enjoys working with clients to resolve family law issues and conflictual cases. In 1985, Jefferson was awarded the designation of Certified Family Law Specialist by the State Bar of California, Board of Legal Specialization. 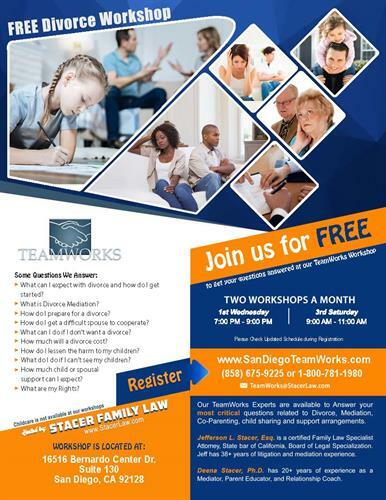 Team Works offers free workshops, free divorce education, mediation services as sponsorship of the live Coparenting Courses for Conflictual Coparents. Our mediation program has earned a powerful positive reputation with the court system. We strive to provide you with the best services possible. Our Law Office offers you a 75-minute consultation appointment to engineer your case to settlement, and legal representation for full-blown litigation cases when necessary. We evaluate your unique, individual situation, determine how we can assist you, then prepare an effective, well-planned case — within our friendly, caring, and understanding environment. You will achieve the best results when we are “partners” on your case. 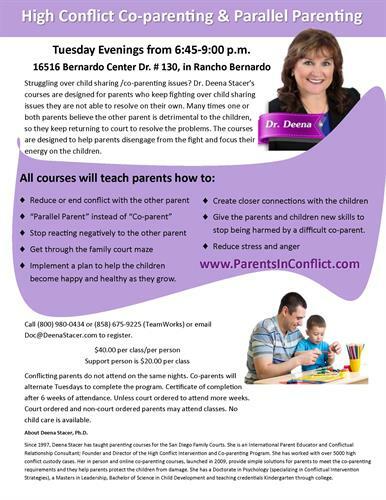 Coparenting Education: Dr. Deena Stacer, has been teaching coparenting education for the courts since 1997. She has earned a stellar reputation with court systems around the globe. She teaches strategies, to help parents end their conflict to protect the children and get out of the court system. Mr. Jefferson L. Stacer, Esq. From I-15, exit on Bernardo Center Drive and turn to head east. Turn left into business complex next to McDonalds. Turn right, then next left and make your way to the lower parking lot.